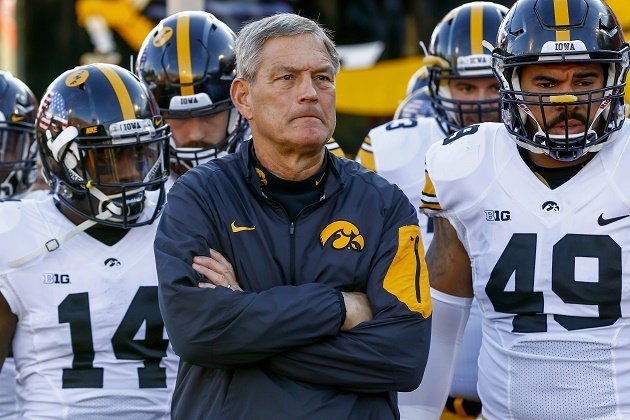 Iowa head coach Kirk Ferentz has been named Big Ten Coach of the Year for the fourth time, something that only one other coach in the history of the conference has done. When you consider Iowa is 12-0 and look at the all-conference team(s), it’ll little wonder Ferentz received the award. Kirk was also named Big Ten Coach of the Year in 2002, 2004, and 2009. The only other Big Ten coach to win the award four times is former Michigan coach Bo Schembechler, who took it home six times. Ferentz won both the Dave McClain (voted on by media) and Hayes-Schembechler (voted on by coaches) Big Ten Conference Coach of the Year awards tonight. The only other individual award won by a Hawkeye was by Desmond King, who was chosen as the Tatum-Woodson Defensive Back of the Year. The all-conference offensive teams were announced tonight and again only four Hawkeyes appear on the squad(s). All notes below are for the teams voted on by the coaches. Iowa’s only offensive First Team selection is Guard Jordan Walsh. He joins Desmond King, who was named to the First Team defense last night. Iowa quarterback C.J. Beathard was named Second-Team All-Conference at Quarterback. Michigan State starter Connor Cook was named First-Team. Center Austin Blythe, a Williamsburg native, was also named to the Second Team. Running back Jordan Canzeri was named to the Third Team. Iowa kicker and Solon native, Marshall Koehn, was chosen to the Second Team. Last night, Josey Jewell (Second Team/Linebacker from Decorah, Iowa), Nate Meier (Third Team/Defensive Line from Tabor, Iowa), and Jordan Lomax (Third Team/Defensive Back) were Iowa’s other defensive all-conference selections. That’s 15 players receiving recognition for a team that’s won 12 games. Michigan State, meanwhile, also has a total of 15 selections. However, FOUR were chosen on the First Team offense. Three others were selected for either the Second or Third Team Offense(s). The Spartans have five more on the defensive teams and three were chosen as honorable mention. All this leads me back to Kirk Ferentz. There can be no doubt, his Big Ten Coach of the Year award is well-deserved. If he doesn’t win the national award as well, there should be an investigation. Go Hawks… beat the Spartans!